Night Owl NVR-IH802-8 - NVR - 8 Channels - 1 x 2 TB NetworkedIntroducing Night Owl's 4K Ultra HD Wired Smart Security NVR. This expandable IP based video security NVR is ideal for protecting and monitoring your home or business. This standalone NVR is sold without cameras, to allow you to customize your system based on your needs. Fully compatible with Night Owl's 4K Ultra HD IP cameras, you will benefit from Night Owl's mind-blowing L2 Color Boost Technology and Rapid Detection Technology (RID). The NVR includes 8 Power over Ethernet (PoE) ports that run video, audio, and power using standard Ethernet cables. With H. 265 Advanced Video Compression Technology, 4K data is efficiently compressed for quicker delivery allowing for an enjoyable remote viewing experience. The 2 TB hard drive provides a tremendous amount of local storage, and redundant backup delivers greater reliability. Introducing Night Owl's 4K Ultra HD Wired Smart Security NVR. 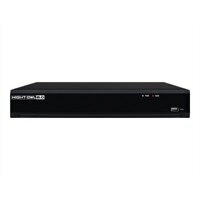 This expandable IP based video security NVR is ideal for protecting and monitoring your home or business. This standalone NVR is sold without cameras, to allow you to customize your system based on your needs. Fully compatible with Night Owl's 4K Ultra HD IP cameras, you will benefit from Night Owl's mind-blowing L2 Color Boost Technology and Rapid Detection Technology (RID). The NVR includes 8 Power over Ethernet (PoE) ports that run video, audio, and power using standard Ethernet cables. With H. 265 Advanced Video Compression Technology, 4K data is efficiently compressed for quicker delivery allowing for an enjoyable remote viewing experience. The 2 TB hard drive provides a tremendous amount of local storage, and redundant backup delivers greater reliability.